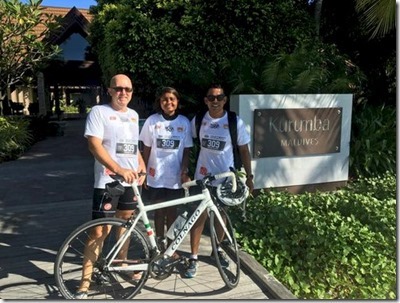 Also flying around the hazardous cobbles of Male, nearly as death defying as the Red Bull skateboarding crew, is the Kurumba triathlon team. 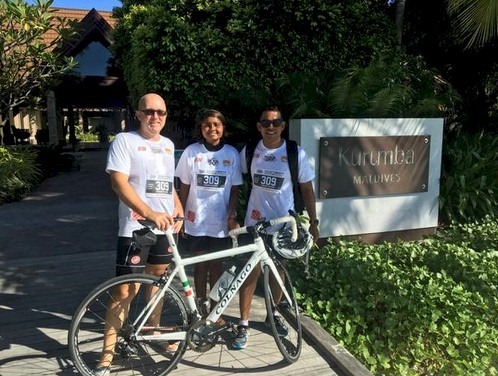 The only resort team in this the Maldives’ second ever triathlon, Thinvaru Triathlon. Each team member prepared extensively, but the big event was full of challenges and not just the obvious multi-disciplinary, cardio-pulmonary ones. Rizu is always in the water and the swimming leg was held in a protected part of the ocean by Male. Nonetheless, it was Rizu’s very first competitive swim (and she’s not a big fan over wearing goggles). Jason rides on a home cycle trainer 4-5 times a week, but quickly discover that IRL is a bit different. First of all, this non-native had to just find his way around one of the smallest capital cities in the world (Shameem had to take Jason for a motorbike ride around the course the day before the event so that he would not get lost). And on the day, the roads weren’t actually closed for the event. So Jason and other cyclists had to dodge cars, motorbikes and anything else that wandered onto the streets. All racing full speed along some pretty rough and cobbled surfaces. “Risky to say the least,” Jason noted. Shameen runs 5-6 times per week for health and fitness. And he had to face perhaps the most bizarre hazard of all as he was confronted by a steady barrage of people on motorbikes coming up to photograph (pap life). Jason summarised the event saying, “Really interesting with the road surface and that the roads were not closed…Bit of extreme cycling and running. Personally, I loved the well set out transition with the shoes, for the mountain bike with the colourful spokie dokies…We also really liked that many different people at different fitness levels gave it a try. From Maldives fastest swimmer and runner, to some competitors who were there just to try and finish. But Team Kurumba didn’t just finish, but came in with an impressive 9th place overall team finish. The next event is being planned for Hulemale in May 2016. Yay Kurumba.